London IBB Polonia volleyball players are playing in the finals of National Cup. Rival of mantees of Vangelis Koutouleas will be Team Northumbria. To reach the finals of the cup competions, IBB Polonia played with the last team in the table of Super 8 League, it means with Malory Eagles. The team from South London was extremely motivated, wanting to surprise, but the hosts were in a good physical condition and not going to be too hospitable. They won decisively, advancing to the final of the National Cup for the first time since 2012. The coach of IBB Polonia Vangelis Koutouleas: – We won a very important game, but as I always say, it’s just another step in pursuit through current season. We’re working hard, not resting on our laurels. There are meetings with demanding rivals ahead of us. The captain of IBB Polonia, Bartek Kisielewicz: – We are extremely happy about this victory. It proves how hard we have been training since the beginnig of the season. There is a chance we might win the first trophy in this season. We want to win the game with Team Northumbria. The chairman of IBB Polonia, Bartek Łuszcz: – I’m enjoying the victory together with the whole team as well as the training staff. On behalf of us all, I would like to thank sponsors and fans from Official Fan Club for support. The atmosphere created during the match was marvellous. We will inform you on the details of finals on our website and on networking sites. 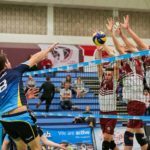 The finals of the competions of the Natioanl Cup will be held on Saturday, April 2 at the National Volleyball Centre in Kettering (Thurston Dr, NN15 6PB). Another game IBB Polonia will play on Sunday, February 28. The rival in the away match will be Team Northumbria. The beginning of the meeting at 13.45 in Newcastle (Sports Central, Northumbria University, Northumberland Road, NE1 8ST).